Planting into a dry seedbed is a frequent challenge for farmers in low-rainfall areas. While most can only pray for a timely rain, a few innovators are injecting water with the seed to spur germination and emergence. While hauling water adds to their workload, it also lifts a load of worry. 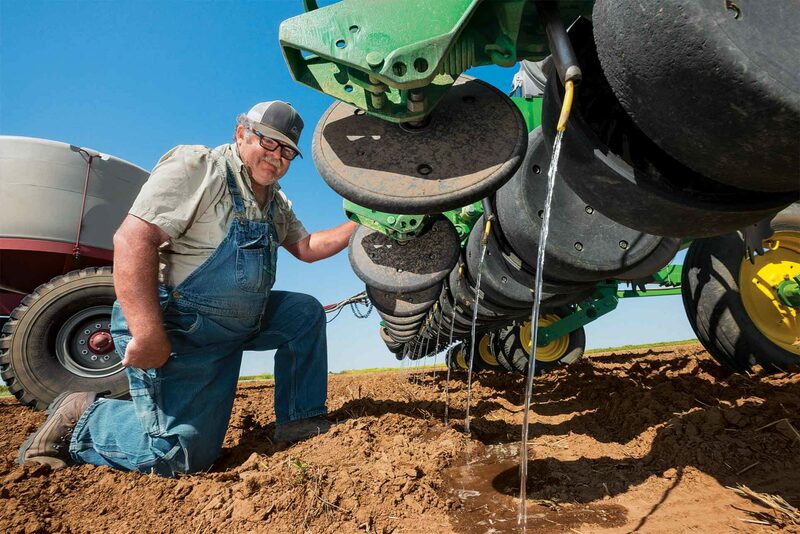 Hugoton, Kansas, farmer Joel McClure has injected water with the seed while planting canola, sunflowers, and soybeans and is anxious to try it with crops like corn, milo, and cotton as well. “Getting a good stand is a critical step to achieving a seed’s maximum potential and using water helps accomplish it. Typically, we have a layer of dry soil on top with moist soil below. Applying water germinates the seed and gives early roots a path to stored soil moisture,” says McClure. McClure credits water injection with allowing him to grow 26-bushel dryland soybeans last year—a feat thought impossible in his area. “Dryland soybeans aren’t insurable in this county, and to my knowledge nobody’s ever done it,” he says. “We compared using different amounts of water—from 20 to 50 gallons per acre—when we planted soybeans last season and the yield with 50 gallons per acre was 20% more than with 20 gallons. Nobody likes to haul water, but it’s worth the trouble, relatively cheap, and we have the capacity to get water to the field with a 3,600-gallon nurse trailer that we use to tend our sprayer,” adds McClure. A cart carries 2,600 gallons of water for Seed Row Saturation on McClure’s planter. 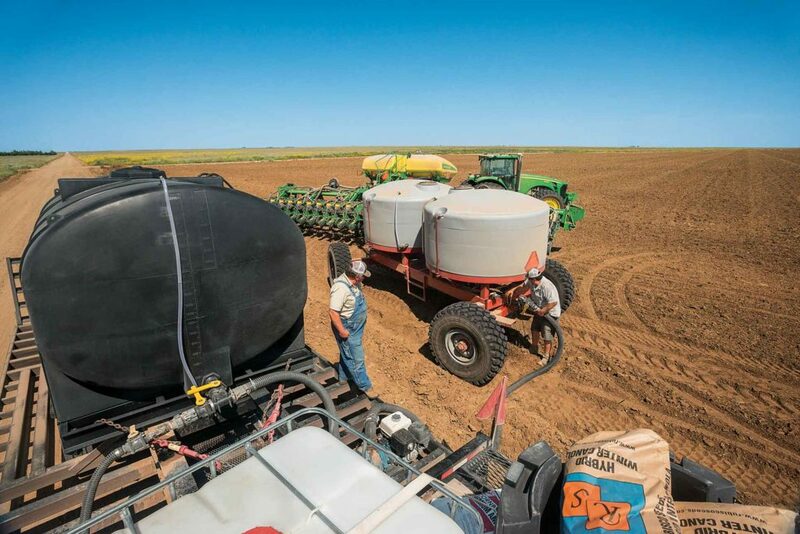 McClure pulls a cart carrying 2,600 gallons of water behind his 24-row 20-inch planter. A positive-displacement pump on the trailer provides the 40 gallons per minute capacity needed to apply 50 gallons per acre while planting at 6 miles per hour. He bought the pull-behind tank used and made the manifolds to distribute the water out of PVC materials Total cost for his system was about $23,000. it allows a grower to pull out of the field knowing his expensive seed will get a good start on the growing season,” says Swanson. A quick start. Winter canola provides a good example of the benefits of water injection. “The seed of the best hybrids is expensive, but because this approach typically results in 90% to 98% emergence, growers can reduce seeding rates and cut costs dramatically,” says Swanson. Swanson adds that canola emerges quickly and uniformly, which can maximize yields and improve the timing of later operations. The crop begins imbibing moisture immediately and abscisic acid—the hormone that maintains dormancy in most seeds—is quickly flushed away. The research showed injecting one gallon of water in 315 feet of row (40 ml/meter) increased wheat yield by 33% in a dry year, but only 4% when water was cut in half. The moisture level in the seed zone remained higher for nine days, and injecting water caused faster germination, denser stands, and higher yields. Other research also shows injecting water benefits sugar beets in Wyoming. Cotton researchers have found an 82% increase in emergence and a 40% increase in lint yield. McClure believes water injection has advantages even under irrigation. “It’s common practice to water a crop up by applying up to three-quarters of an inch with a quick turn of the pivot. However, this also germinates the weeds while injection gives the crop a head start over them,” he says. “Based on soil type, it takes 55,000 to 83,000 gallons of water costing $25 to $40 per acre to do this with a pivot. Seed Row Saturation uses 50 gallons per acre (6,050 gallons total) costing about $5 per acre and there’s virtually no loss to evaporation,” adds Swanson. Gearing up. Swanson’s Seed Row Saturation system can include a high volume pump, manifolds, poly hose, and stainless steel tubes. While water is transferred to the planter under high pressure, it flows into the seed trench through single or dual tubes at very low pressure to avoid splashing. Solar is surging, but act quickly for the fastest ROI.